If only we could put far-off places on wheels and yank them closer, our gardening lives would be so much easier. 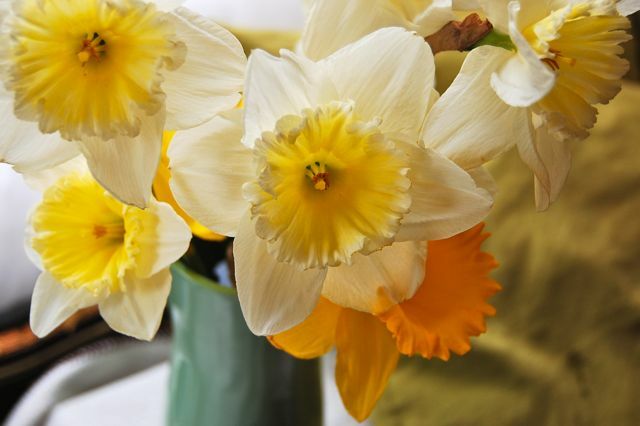 All the flowers in this genus are capital-N Narcissus. 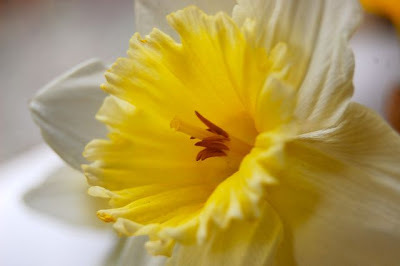 However, in common garden parlance, the large-trumpeted kind are generally dubbed daffodils and the small-trumpeted ones get called narcissus or jonquils. The variety that makes up most of this bouquet is N. ‘Ice Follies’, one of the best all-round choices (also seen in closeup below). It’s a good naturalizer, lightly fragrant, and has that large, frilly trumpet or corona that turns from cream to yellow as it matures. Daffs get squelched by my tree-root-infested garden. In less congested conditions, though, they are generally unfussy. Think of them spilling down the hillside near the logos by the Gardiner Expressway. All they insist on is good drainage and winter snow coverage. See, there’s a reason to be glad Toronto has winter. Our snow is a cozy blanket protecting a few of the early hellebore buds which got bit ahead of themselves. Love that last photo especially, and I appreciate learning more about 'Ice Follies' as it's one of those I've considered in the past but not invested in. Didn't know it was (if mildly) fragrant; that's certainly a point in its favor!